Every month, Dragonfly sponsors “Dabble In Art Nights” at local nonprofit organizations. We provide the art supplies and some snacks for the clients to be able to have some fun creating art. 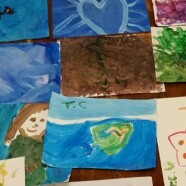 We always marvel at the hope we see in the paintings and the connection with the volunteers. Kids and adults simply love it. We often create collage “Vision Boards” to help with goal-setting for a brighter future. Volunteers bring snacks and supplies and help manage the paint — so kids don’t get covered head to toe! 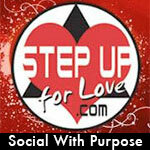 This is one of many volunteer opportunities through the Meetup Dragonfly created called Step Up For Love. Get together at least 10 guests and find enough table and chairs to accommodate them all and we can have a Dabble In Art Event at your home, office, community club house, etc. Participation fee is only $15 per person, prepaid, and that covers all supplied art supplies and choice of ONE canvas or TWO sheets of paper. Participants take home their creations and are encouraged to bring a snack or drink to share. There will be no formal art instruction, although ideas and suggestions may be provided. This is relaxed, informal fun with no wrong way to do it. Duration is two hours and must be booked at least two weeks in advanced. Call 407-236-6559 for more information.